Looking for common grounds when it comes to date plans is already a challenge. It becomes difficult if you’ve committed to become healthy. Even more so if you’ve been struggling in leading your partner to a more fit lifestyle. Studies have shown that it is better to undergo a wholesome change as a couple. It is encouraging having someone experience difficulties with you. It inspires you to push through and garner progress with your goals. Listed below are date ideas that you and your loved one could enjoy over the weekend. These will also help you steer clear from those “I’m having a bad day” diet cheating schemes. It will instead aid you to have a positive stance towards this dreaded word. There’s no shame in accessing humanity’s greatest invention – food delivery. You don’t have to be Jamie Oliver every night. And no, you shouldn’t hate yourself for being too busy to bother cooking anything from scratch. Kick back and reach for your phone and order in. Restaurants, delis, and other establishments are now offering healthy options. There is even a chef-prepared meal delivery that you can take advantage of. Calling for delivery no longer means leaving the long and beaten path to healthier diets. “Agriturismo” is Italy’s best-kept accommodation secret. Its domestic counterpart has been gaining traction lately. This important trip encourages tourists to immerse in farm life. You can learn about the journey your produce takes before reaching your table. This is a great way to appreciate food while making wise use of your paid holidays. During your stay, you can harvest vegetables, milk cows, and do other farming duties. You can also go on hikes and admire the surrounding nature. Scenic views, cuddly animals and fresh air are extra cherries on top. If you only have a few hours to spare, you can visit local farms near you. Farmers are now opening their gates to visitors interested in agriculture. Be sure to be courteous and call ahead to inquire on when would be a convenient time to visit. After learning more about food, you can spice up your date night with a bit of competition. Work on a theme for a holiday or a specific cuisine like in The Final Table. You can even choose a specific ingredient à la Masterchef. This fun activity is a great way to encourage cooking at home which is most often healthier than eating out. This is because you have control in using local produce over processed ones. You may even come up with a recipe that can convert any kale hater. The goal should be fostering a healthy attitude towards diet. It is not about sacrificing delicious food. Instead, it is about gaining nutrition with delicious and fresh meals. It should make you feel better and not make you feel pressured to fit into those skinny jeans. Above all else, it is something that you can enjoy as a couple. 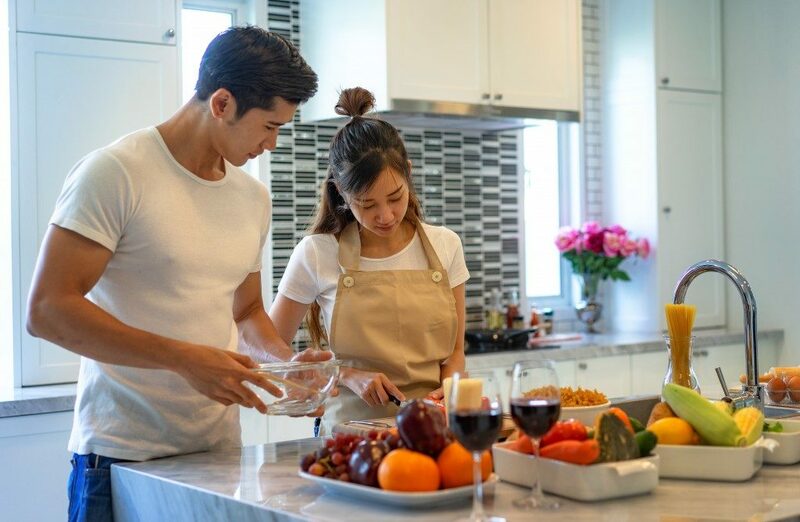 You don’t have to settle for the traditional film and dinner date; there are many ways you can spice up the romance and make your partner see your healthy side.